References to Mary in Holy Scripture are admittedly sparse, but those instances are very strategic in the story of the Gospel. She is prophesied in the opening chapters of Genesis, portrayed in the Gospels for her part in the Incarnation, and finally described in grandeur in the last book of the New Testament. From Genesis to Revelation Mary is described playing a key part in the Gospel story. Here, in the earliest chapters of Genesis, God details how he will save humanity. 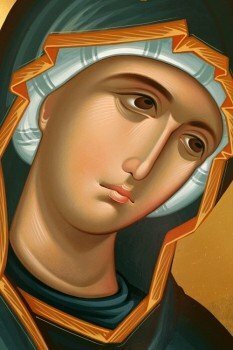 If the writer did not want to emphasize the role of Mary, he could have simply removed the added emphasis on the woman. But he did not, and these words were chosen carefully to stress the important role of Mary in the Gospel. In this prophecy there are three main characters, Jesus, Mary, and Satan. These three characters will again appear in Revelation. This scripture along with “Let it be to me according to your word” are examples that Mary has left behind for us to follow. As Mary did, so should all Christians, live a life submitted completely to the will of God. Though John has the last recorded words of Mary, there is much more to be found of her in Revelation. Now a great sign appeared in heaven: a woman clothed with the sun, with the moon under her feet, and on her head a garland of twelve stars. Then being with child, she cried out in labor and in pain to give birth. And another sign appeared in heaven: behold, a great, fiery red dragon having seven heads and ten horns, and seven diadems on his heads…. And the dragon stood before the woman who was ready to give birth, to devour her Child as soon as it was born. She bore a male Child who was to rule all nations with a rod of iron. And her Child was caught up to God and His throne… So the great dragon was cast out, that serpent of old, called the Devil and Satan, who deceives the whole world. The three characters prophesied in Genesis are now seen in a vision in Revelation fulfilling the prophecy. As prophesied the serpent is defeated by Jesus, the son of Mary. Mary is depicted in key moments throughout scripture emphasizing her role in the Gospel story. And here, in the last book of the New Testament, we see her described in very grand and royal terms. This is a very important woman.